Should You Buy LyondellBasell Industries NV (LYB)? The latest 13F reporting period has come and gone, and Insider Monkey is again at the forefront when it comes to making use of this gold mine of data. We have processed the filings of the more than 700 world-class investment firms that we track and now have access to the collective wisdom contained in these filings, which are based on their September 30 holdings, data that is available nowhere else. Should you consider adding LyondellBasell Industries NV (NYSE:LYB), one of the 10 Best Companies for Chemical Engineers, to your portfolio? We’ll look to this invaluable collective wisdom for the answer. LyondellBasell Industries NV (NYSE:LYB) shares didn’t see a lot of action during the third quarter among hedge funds, as net ownership of the stock was unchanged. Hedge fund ownership has generally trended down over the past three years, which is why the stock widely missed our ranking of the 30 Most Popular Stocks Among Hedge Funds. Interestingly, billionaire money managers are a lot more keen on it, as it pulled out a 15th place finish on the ranking of the 20 Dividend Stocks That Billionaires Are Piling On. LYB shares now carry an impressive 4.71% dividend yield. Today there are a lot of methods stock traders put to use to analyze stocks. Some of the less utilized methods are hedge fund and insider trading indicators. Our experts have shown that, historically, those who follow the best picks of the best hedge fund managers can outpace their index-focused peers by a healthy margin (see the details here). At Q3’s end, a total of 39 of the hedge funds tracked by Insider Monkey were bullish on this stock, unchanged from one quarter earlier. 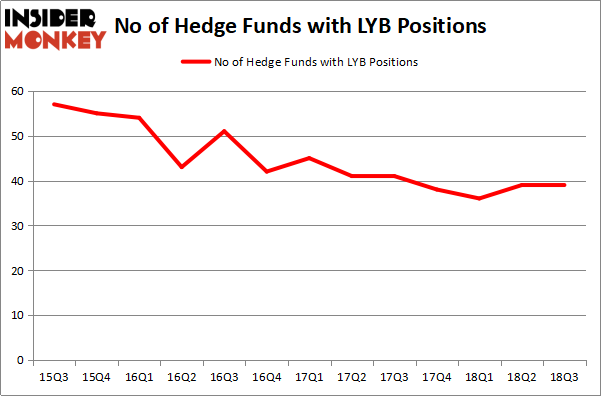 On the other hand, there were a total of 38 hedge funds with a bullish position in LYB at the beginning of this year. With hedge funds’ sentiment swirling, there exists a few notable hedge fund managers who were increasing their stakes considerably (or already accumulated large positions). 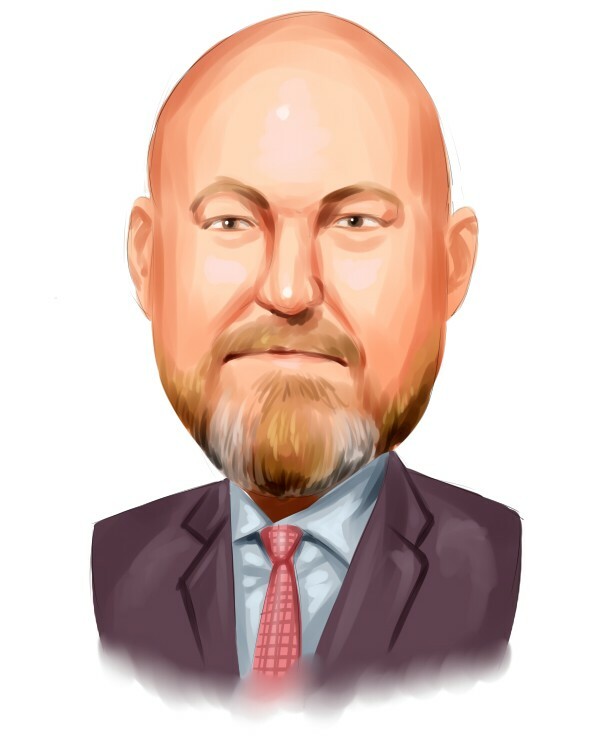 According to Insider Monkey’s hedge fund database, Cliff Asness’ AQR Capital Management has the number one position in LyondellBasell Industries NV (NYSE:LYB), worth close to $1.02 billion, comprising 1% of its total 13F portfolio. Sitting at the No. 2 spot is Point State Capital, led by Zach Schreiber, holding a $258.3 million position; 3.4% of its 13F portfolio is allocated to the company. Some other members of the smart money that hold long positions include Ken Griffin’s Citadel Investment Group, Brandon Haley’s Holocene Advisors and Peter Rathjens, Bruce Clarke and John Campbell’s Arrowstreet Capital. Judging by the fact that LyondellBasell Industries NV (NYSE:LYB) has experienced bearish sentiment from hedge fund managers, it’s easy to see that there exists a select few fund managers who were dropping their positions entirely in the third quarter. Interestingly, Clint Murray’s Lodge Hill Capital said goodbye to the biggest stake of all the hedgies followed by Insider Monkey, totaling about $33 million in call options, and David Halpert’s Prince Street Capital Management was right behind this move, as the fund cut about $31.3 million worth. These transactions are intriguing to say the least, as total hedge fund interest stayed the same (this is a bearish signal in our experience). Let’s now take a look at hedge fund activity in other stocks – not necessarily in the same industry as LyondellBasell Industries NV (NYSE:LYB) but similarly valued. These stocks are Canadian Natural Resource Ltd (USA) (NYSE:CNQ), Kimberly Clark Corp (NYSE:KMB), Royal Bank of Scotland Group plc (NYSE:RBS), and Kinder Morgan Inc (NYSE:KMI). All of these stocks’ market caps are closest to LYB’s market cap. As you can see these stocks had an average of 26 hedge funds with bullish positions and the average amount invested in these stocks was $670 million. That figure was $2.38 billion in LYB’s case. Kinder Morgan Inc (NYSE:KMI) is the most popular stock in this table. On the other hand Royal Bank of Scotland Group plc (NYSE:RBS) is the least popular one with only 6 bullish hedge fund positions. LyondellBasell Industries NV (NYSE:LYB) is not the most popular stock in this group but hedge fund interest is still above average. This is a slightly positive signal but we’d rather spend our time researching stocks that hedge funds are really bullish on, like KMI.